North Korean leader receives report on Guam attack plans but will hold off for now, says North Korean media. 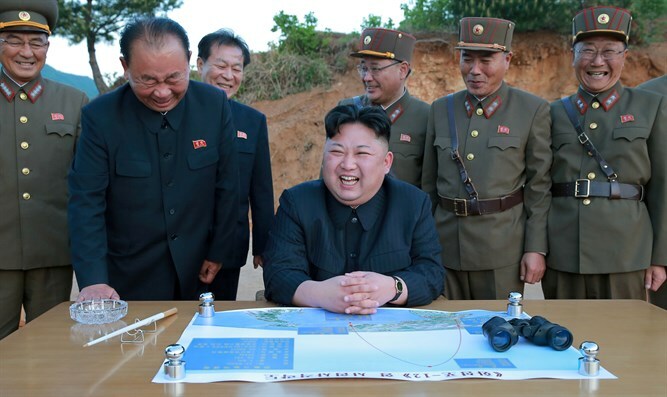 North Korean leader Kim Jong Un is holding off on attacking Guam – for now. Kim received a report from his army on its plans to fire missiles toward Guam on Monday night, and said he will watch the actions of the United States for a while longer before making a decision, Reuters reported, citing the North's official news agency KCNA. Kim, who inspected the command of the North's army, examined the plan for a long time and discussed it with army officers, KCNA said. North Korea last week threatened a missile attack on Guam, a tiny U.S. territory in the Pacific, in response to President Donald Trump’s warning that Pyongyang faced "fire and fury like the world has never seen" if it continued to threaten the United States with its missile and nuclear programs. On Friday, Trump tweeted that military options for a potential threat from North Korea are "fully in place," and urged Kim to de-escalate the current confrontation with Washington. The KCNA report came hours after U.S. Defense Secretary James Mattis warned that an attack by North Korea against the United States could quickly escalate into war. If North Korea fires a missile at Guam, "then it's game on, and we will try and do our best to make sure it does not hit the United States," he added. Kim said on Monday the United States should make the right choice "in order to defuse the tensions and prevent the dangerous military conflict on the Korean peninsula," the KCNA report said. The visit to the Strategic Force of the Korean People's Army (KPA) marks Kim's first public appearance in about two weeks. The North's leader ordered the army should always be fire-ready should he make a decision for action, the report said.